The Pakistani Taliban are planning to attack foreigners helping with flood relief efforts in the country, a senior US official has warned. The official also said "federal and provincial ministers" may be at risk. Some UN agencies say they are now reviewing their security procedures. It has now been four weeks since the start of the flooding, described as the region's worst humanitarian crisis. The UN says more than 17 million people have been affected by the floods. As floods sweep down from the north, they are threatening to breach an embankment in the Kot Almo area in Sindh province, forcing thousands of people in the southern Thatta district to flee from their homes. Throughout Pakistan, about 1.2 million homes have been destroyed in the monsoon floods, leaving 5 million people homeless. 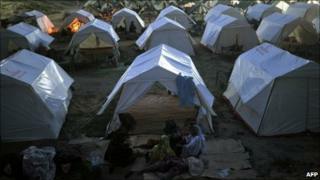 Aid agencies are focusing on providing emergency relief such as shelter, food and medical care. The militant group Tehrik-e Taliban "plans to conduct attacks against foreigners participating in the ongoing flood relief operations in Pakistan", a US official, speaking on condition of anonymity, told the BBC. There have been no such attacks so far, but Tehrik-e Taliban is considered the most radical and violent militant group in Pakistan. A retired Pakistani general, Talat Masood, told the BBC that the militant group would seek to counter any gains in public support for Western governments helping with relief and aid work. "People in Pakistan generally had anti-US and anti-West feeling in the past for various reasons, and now with this sort of assistance, it's very likely that the people might change their attitude. [The militants] may not like all this because they obviously cannot compete," he said. The US is one of a number of countries to have sent aid and assistance to Pakistan. The US Agency for International Development says that it has so far provided around $150m (£97m) in support to victims of the flood. A spokesman for the World Health Organization told the BBC that aid work in Khyber-Pakhtunkhwa and Baluchistan was already being affected by security concerns. "Now with this threat it means either we have to downsize the operation - which means less access to the effectees - otherwise we have to take more mitigation measures in order to reduce the security risk, which means more resources," Ahmed Farah Shadoul said. "This will definitely delay the operation in certain areas." The warning came hours after a top US general involved in the military relief effort said his men had not encountered any security problems in flying aid to Pakistan. "We have seen no security threat whatsoever in the three weeks we have been operating here," Brigadier General Michael Nagata was quoted by the AFP news agency as saying. He added that the Pakistani military had done a "highly effective job in providing our force protection and security". Various nations have pledged more than $700m (£552m) for relief efforts in Pakistan. Workers have begun clearing up as the floods recede in the north and the UN has appealed for more helicopters to reach 800,000 people who are cut off.